Foot pain is an issue almost as prominent as back pain these days, but we don’t pay it that much attention – and we should. One of the most common causes of foot pain is plantar fasciitis, and it can become quite nasty if left untreated. That foot pain isn’t just going to go away overnight – you have to do something about it. While foot massages and other treatments are a good start, the first step you should take to fix the problem is changing how you treat your feet every day. That means changing your shoes too. Today, I’ll help you with that by taking a look at some of the best shoes for plantar fasciitis that I could find. I know that most people haven’t even heard of plantar fasciitis, even though they might have it. It’s a condition that often goes undiagnosed and untreated since it seems more harmless than it is. Here’s the deal – plantar fasciitis is a chronic inflammation of the plantar fascia ligament, causing intense pain in your sole, heel and arch. The plantar fascia is the longest ligament in your foot, running from the bottom of your heel bone to your toes. It’s incredibly thin, and it’s what allows you to maintain your balance and allows your feet to support your body weight, so it’s under a lot of pressure. So, how does it become inflamed? There are a few misconceptions about what causes plantar fasciitis, and the main one relates to heel spurs – tiny bone bumps that can grow on your heel. As far as we know right now, these growths don’t cause plantar fasciitis at all. Plantar fasciitis also isn’t hereditary. Sure, some risk factors can be passed down genetically, but that’s not a guarantee that you will ever develop plantar fasciitis. It’s an acute or chronic condition that can be prevented or cured, provided that you take proper care of your feet. But, how do you know if you have it? About two-thirds of people affected by plantar fasciitis only get it in one foot, which makes these symptoms easier to notice, but there are still people who get in both feet at the same time. If these symptoms are not the direct result of a fresh injury and persist for a week or longer, you probably have plantar fasciitis. Be aware that these symptoms can also be caused by other conditions, so make sure you go to the doctor and get properly diagnosed. I know there are a lot of therapeutic shoes out there that are expensive and don’t seem to help with anything. Because of that, you might be sceptical that shoes can help you with plantar fasciitis and that’s understandable. That’s why I’ll go over some of the main characteristics and benefits of shoes for plantar fasciitis to help you dispel those doubts. For starters, what are these shoes? Well, in short, these are just shoes that have the right shape and the correct amount of support needed to help relieve your plantar fasciitis by lessening the strain and pressure that’s put onto your feet. They can be therapeutic shoes, but they don’t need to be – any shoes with the right shape, and proper support will do, no matter the cost or type. Some of the best shoes for plantar fasciitis might not even be designed with it in mind. Still, most of these shoes will offer the same type of benefits to a plantar fasciitis sufferer. Most shoes for plantar fasciitis are roomier than regular shoes, thus giving allowing for a wider range of movement for your feet. In addition to that, since they will relieve the swelling by supporting your feet better, you’ll find that you’ll be more flexible when walking or running and it will all feel easier to do. The main benefit that shoes like this should offer you is pain relief. You should feel less pain from walking or running when wearing shoes for plantar fasciitis. Your pain should be lessened as soon as you start wearing them, but if you’re looking for a huge improvement, I’m afraid that you’ll have to keep wearing the shoes for a few weeks to see that. The reason these shoes help is because they offer better support for your foot, putting less strain and pressure on your inflamed plantar fascia. This helps it relax which reduces the swelling, thus reducing the pain you’re feeling. Shoes for plantar fasciitis usually have thicker soles with good shock absorption properties. They are designed to put as little pressure on your feet as possible, and you’ll definitely feel that, especially when running. The knock-on effect from the force with which your feet hit the ground when you’re running can have an effect on your entire body, so this is always a plus. It isn’t good just for your feet but for the rest of your body as well. If you’re not sure not sure what to buy yet, here are my thoughts on what I think are the best shoes for plantar fasciitis currently on the market. The best thing about these shoes is how roomy they are – they will never feel constricting, and you have enough room to wiggle your toes around. So far, the cushioning in it seems to hold up well. The sole is thick and absorbs most of the impact so walking in them tends to feel quite comfortable and stress-free. The insoles are decent, but nothing special. They are removable though, so you can easily replace them with better ones if you buy them separately. Let me tell you this though – use these shoes for walking, not running. They’re a bit too heavy to be proper running shoes, and they do tend to get hot since there’s not a lot of ventilation. It doesn’t matter how shoes are labelled – if a supposed running shoe is heavy, bulky and rigid, you shouldn’t run in it. Don’t just follow the label, follow your own common sense. While these are primarily running shoes, you can wear them for your everyday activities as well, since they’re rugged and durable. Also, despite being marketed as men’s shoes, they’re perfectly well-suited for women as well. Just try them out ladies, you won’t regret it. The sole is reasonably thick, but it remains quite flexible so it’s easy to move in them even though they might appear a bit bulky. You won’t feel too much of the impact when you’re running since the sole tends to absorb most of the shock and the support around the heel area is superb. However, there’s not a lot in the way of cushioning, and the shoe inserts are sub-par. They are also a bit on the steep side, so you might want to wait for a sale. Manufacturers tend to label certain shoes as men’s or women’s models purely based on the look or overall size of the shoes when they can easily be worn by anyone. Don’t limit yourself and freely test out shoes for the opposite gender – they might fit you better. If you have a high arch, these shoes will be ideal for you since they have extremely prominent arch support. Don’t get them if your arch is low though – you will feel uncomfortable. 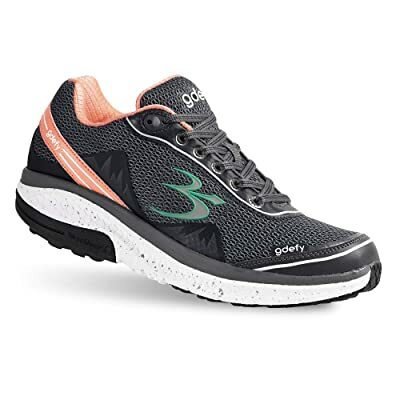 The outer sole is also great at shock absorption, and that combined with the decent cushioning inside the shoe makes it feel exceptionally comfortable. They’re decently breathable as well, and you probably won’t have problems with your feet sweating inside them. As far as space goes, they’re not exceptionally roomy, but you won’t feel trapped either. The largest issue with them is the fit – as you can see, barely 58% people had the right fit when they ordered them. They run small, so you should get half a size or even a full size up, and that should resolve the issue. Besides that, they are a bit on the flimsy side, especially the loops for the shoelaces. Nothing major, but still noticeable. Always check the user experiences when you’re ordering shoes without trying them on first – if they’re a poor fit, you’ll find some advice there, for sure. Overall, these shoes seem to be a great fit for most people, and you can definitely see that they’re designed for running. They have a clean, sleek look and they’re available in a wide variety of colours. However, they’re not all looks. The foam inside them feels quite comfortable, and there’s a lot of it. Combined with the sturdy rubber soles, this makes for quite a comfortable shoe. Sadly, that foam cushioning does tend to fall out after they clock around 300 miles or so don’t expect them to last all that long. The insoles are better than you would expect and combined with the overall shape of the shoe, they offer great support for runners with a high arch. They feel a bit heavier than I thought a running shoe with the moniker of ‘ghost’ should feel, but it’s not a huge deal. Insoles can last longer than shoes do – if you have a pair of good insoles from shoes that fell apart don’t be afraid to reuse them with a new pair of shoes. Just make sure to wash them well. Running with these shoes on is quite a joy since they feel like they’re almost weightless. 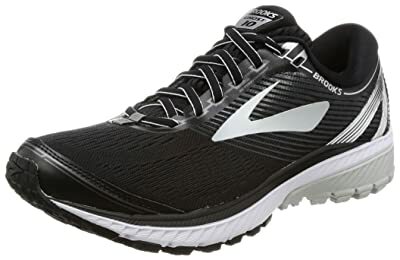 They don’t weight significantly less than most other running shoes, but the weight seems to be balanced better, resulting in them having a lighter feel. They’re quite a snug fit, bordering with being a little tight in the toe box, which is smaller than it looks at first glance. However, they do fit decently for most people. Overall, they seem to offer quite a good mix of high arch support and overall comfort with quite a lot of cushioning inside them. Though there’s a lack of heel support, and your heel might start to slip out when you’re running, especially on inclines. Besides that, this is quite a flexible, but durable shoes and all the parts seem to gel well. The cushioning won’t fall out in a matter of months like with most shoes, and the sole can take quite a beating. Don’t be fooled by how a shoe looks from the outside. If you can, try it out and if you can’t look at the experiences of others who’ve worn it to check how it’s like on the inside. 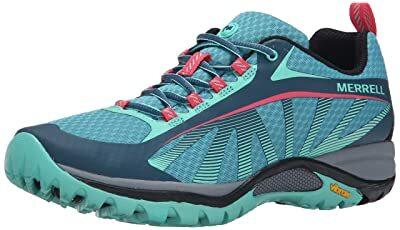 This is another good offering from Gravity Defyer – it’s a breathable and comfortable shoe that can be used for both walking and running. Still, they do seem to be best suited for long periods of standing around. If you’re a cashier, for example, these shoes will be a godsend. The sole is quite thick and supportive, and the cushioning is extensive. It’s sturdy too so you can get a lot of use out of it. The support it offers is decent but nothing to write home about. It doesn’t come with insoles that are that good, but they can easily be removed and replaced with better ones. The shoes are made with that in mind. However, they are a bit tight at the top so putting them one can be quite a chore if you have large feet – or if your feet happen to be swollen. While you can use one pair of shoes for both walking, running and work, it’s not something I would advise. Try to have a different pair for every activity. One of the high points of this shoe is the high-quality insole inside it, made specifically for treating plantar fasciitis. 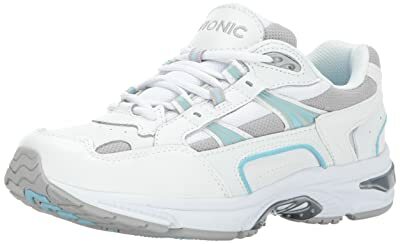 It offers great arch and heel support while being thick and cushioning your feet well, protecting them from impact. Despite how they look, they’re also surprisingly lightweight due to their sole using air cushioning. They’re still heavier than most running shoes, but that’s due to the soft leather used to make the upper. They’re also quite a bit deeper than most other shoes but roomier as well with plenty of space for your toes. So, overall, they’re decent, but there are a few problems. Firstly, they’re not breathable at all, and it seems like they’re intended for rougher weather. However, they’re not waterproof either. They are bit overpriced too, but they are comfortable even though they are a bit rigid and stuffy. While leather is not the best choice of material for plantar fasciitis shoes, it can still work. There are no ironclad rules when it comes to shoes, and you should try out everything that seems like it might fit you. Let your sore feet be the final judge. If you’re looking for a pair of affordable shoes that will help you deal with your plantar fasciitis, this is not a bad choice. They’re not too expensive and are more durable than you might expect. The arch support is quite good here, due to the EVA midsole that’s raised up a bit. They’re not for extremely high arches, but for slightly raised ones they will work wonderfully. The heel support is especially good with the insoles provided with the shoes. There’s plenty of space for your heel in there, and if any swelling occurs, you won’t feel it as much. On the negative side, they do feel a bit stiff overall, probably due to the synthetic used in the upper. And – well, this is subjective – but they look quite ugly, don’t they? I know I’m not the only one who thinks that. When you’re buying shoes for plantar fasciitis or any other condition, you should always put function above form, no matter how much you like your shoes to look great. 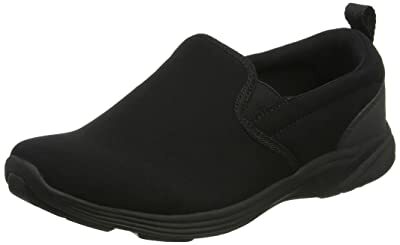 If you’re looking for something to take to work, especially if you’re working in a medical profession, these clogs are a good choice. One of the most important things is that they’re comfortable and provide decent support for plantar fasciitis. Their heel support is lacking, but the arch support is more than good enough to make up for that. They’re obviously sturdy and built to handle a lot of pressure while also being safe – you won’t slip in them on wet surfaces. Unlike most of these shoes, they’re machine washable and can be dried in the dryer, which is a big plus when it comes to maintenance. The main problem with them is that you’ll be sweating a lot while wearing them since they lack any ventilation. They also absorb smells so they’ll stink almost constantly. You’ll probably need to wash them daily if you’re using them for work. Clogs might seem unsafe for a work environment, but as those in the medical profession will tell you, they’re among the best work shoes around. Don’t hesitate to try them out, especially if you have plantar fasciitis. The lack of constraints on your heel will help with the pain. 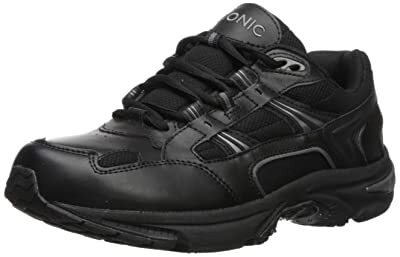 While these trainers might look quite flimsy, they’re surprisingly durable and good at providing support. The arch support they provide is decent, but the heel support is even better. They’re laceless, which has some upsides and downsides. They’re easier to put on and take off, but you can’t exactly adjust how tight they are to your liking. Luckily, they do offer plenty of room for your feet. Despite the mesh upper though, they’re not breathable enough, and your feet will certainly get hot inside of them. They also absorb smells rather easily, and it’s difficult to wash them, which is the worst combo imaginable. 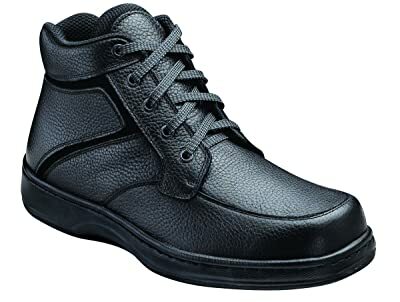 Laceless shoes like this can look like a cheap gimmick, but for people who can’t bend down to tie them, they’re lifesavers. They might be the right for you as well – you won’t know until you try them out. While these are marketed as women’s shoes, they’re accessible to men as well – if you can fit into women’s sizes, that is. Their shape can certainly be a problem. They’re a bit on the long and narrow side, which can feel a bit constricting. Besides that, however, they’re quite good shoes. The support they offer for your arch is superb, and they’re well-cushioned too. The upper is mostly made out of leather that’s flexible enough for comfort, but it’s not too breathable. It has quite a good pair of insoles made from textile and EVA and quite accommodating. Combined with a flexible and sturdy outsole, they provide quite a lot of comfort and relief. If your shoes are too narrow and your foot can’t move around, that will put additional strain on your plantar fascia, the same as if the muscles in your foot were rigid. It’s nice to see that even hiking shoes are being designed with plantar fasciitis sufferers in mind. They start off well by offering a lot of good cushioning, a tough sole made out of Vibram that’s good at absorbing shock and proper arch support. The heel support is also decent, and the inserts that come with the shoes are nothing to scoff at either. One of the major issues with them is waterproofing – they’re simply not, even though the manufacturer claims they are — not a good look for hiking shoes. They also don’t hold up well in more extreme condition and will probably be falling apart in a matter of months. They’re not as durable as they claim to be. Hiking if you suffer from plantar fasciitis is perfectly possible with the right pair of shoes on your feet. Be careful but don’t let this condition stop you from doing what you love. 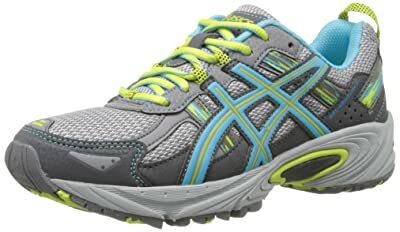 If you’re looking for a pair of running shoes, ASICS is a good brand for you. 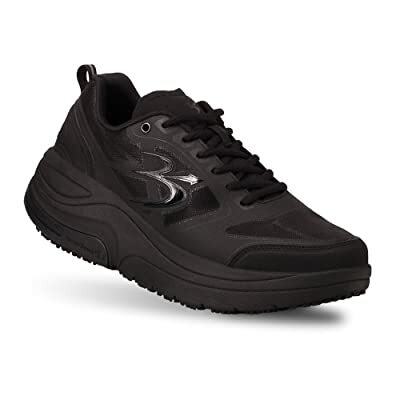 They offer a wide variety of running shoes, and this is one of their better products. While not the lightest shoe available, it’s quite well-balanced, so you’ll barely feel the weight of it when you’re running. The mesh is breathable, and your feet won’t get stinky inside of it. The sole is thick, and the inside cushioning is quite comfy. It’s roomy as well, offering more than enough space for your toes to wiggle around. Well, they don’t offer quite enough support for people with plantar fasciitis. They might still be good for you if you have a lower arch, but they certainly aren’t as supportive as you’d expect. Luckily, the shoe inserts are removable, so this can be improved upon with some good orthotics. If you think a shoe is great but it has one flaw and you believe you can fix it, go for it. It might just be worth the trouble. Sometimes it might feel like high arches get all the love, so here’s a pair of shoe well-suited to those of you with low arches that suffer from plantar fasciitis. The support they offer is great, both in the arch and the heel area and you won’t overpronate when you’re wearing them. The outside of the shoe is made from leather, but it’s not rigid at all – everything from the sole to the top is quite flexible. There’s not much wrong with these shoes overall, but there are a few minor problems. For example, the soles can get quite slippery when it’s wet. They’re also on the heavier side, but they are walking shoes, so that’s less of a problem. You shouldn’t run in them. While people with low arches are less likely to suffer from plantar fasciitis than people with a high arch, they’re still at risk. Wearing shoes like this can help stop plantar fasciitis from occurring. The fit of these shoes is quite consistent, and you get what you ordered. They’re lightweight and clearly designed with runners in mind. As far as arch and heel support goes, there are no problems with that here – the shoes deliver on both fronts. The sole is flexible yet rugged and great at absorbing the impact during running, while the cushioning inside makes the shoes extra comfy. The rearfoot GEL cushioning system keeps your heel safe in particular. However, if you’re looking for stability, you won’t exactly find it here. The soles are quite slippery, and on surfaces like marble or tiles, you’ll have a hard time. If they’re wet – God help you. 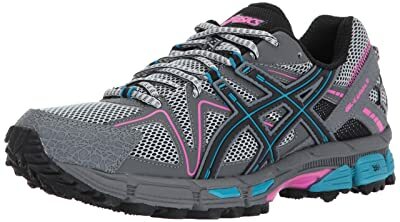 I know it’s a minor complaint, but ASICS shoes can look quite ugly, and the colour combinations here are not nice at all. It’s not just me either – plenty of people complain about it. Your running shoes need to be stable on almost all surfaces – you’re in serious danger if they’re not. 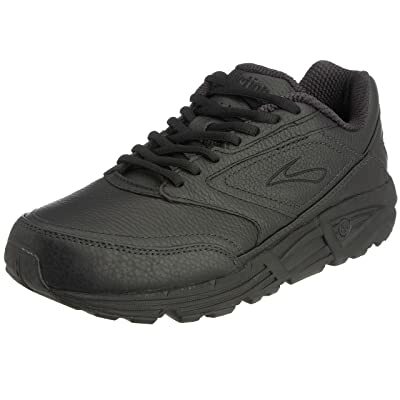 These shoes have an extra wide and thick sole that’s great at shock absorption during long work hours. They also feature an extremely roomy toe box, which is uncharacteristic for women’s shoes but much appreciated by the ladies I’m sure. You might not notice at first, but the sole is grippy as well, allowing you to stay on your feet even on slippery surfaces. That’s another thing that makes them great for work environments. Sadly, they don’t offer quite as much arch support as you would expect, even though their heel support is quite good. It can be fixed with better shoe inserts, but still. Women’s shoes tend to be made with pointy tips, which is the reason a lot of female medical workers buy men’s shoes – they’re just more comfortable. It would be great if this trend changed. 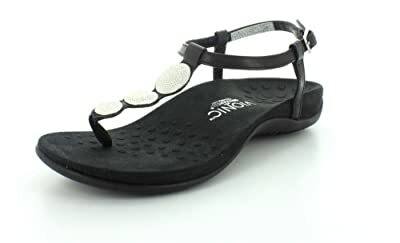 If you’re looking for something more casual that will still help you with your plantar fasciitis, these sandals are a good choice. They look stylish and free up your foot while also having a tough rubber sole that offers more than adequate support for a high arch. Their heel cup is also great for people with plantar fasciitis. The adjustable heel strap helps a lot with the fit, but they do have a strange shape, and it can be difficult to find the right size without trying them on. They can also feel a bit heavier than you would think at first. When people think about therapeutic shoes for dealing with foot conditions, they think of large, ugly, bulky shoes – but that doesn’t have to be the case. These sandals are a great proof of that. Here’s another piece of footwear that’s proving that comfortable shoes don’t necessarily have to be ugly. These are shoes that you can wear to a fancy party, and they won’t look out of place. This is more important than you might think, especially for women who are often forced to wear uncomfortable shoes that make their plantar fasciitis worse, when attending formal events. They also offer plenty of space for your feet and won’t squish your fingers together. Moreover, they’re durable and hold up well even if you wear them a lot. However, you might see some peeling on the leather. They won’t look as nice, but they’ll still be functional. Sadly, they are not as breathable as they appear at first and your feet might get hot in them. High heels with pointy toe boxes are probably the worst shoes you could be wearing if you have plantar fasciitis. Avoid them whenever possible and find other alternatives, for the good of your feet. There’s a certain mindset that’s drilled into us when it comes to buying shoes – and I need you to throw most of that out of the window for now. You’re not buying regular shoes, you’re buying shoes to help you with your condition and here’s what you should keep in mind while making that purchase. The most important thing about your new shoes will be their shape. This will determine how well they fit your foot and how supportive they are – the most important thing when it comes to dealing with plantar fasciitis. I’ll go through each of the major parts of a shoe and tell you what kind of shape it needs to have in order to help you with your plantar fasciitis. The most important part about the insole is probably the middle – the part that supports your arch. Now, since both people with low and high arches are at risk for plantar fasciitis, the shape that you require will differ. People with a high arch will need shoes with an elevated midsole, while those with a low arch will need a flatter midsole. A deep heel cup with thick cushioning is also important since it will help support your heel and reduce the amount of pressure and stress placed upon it. This will also let it expand when it gets swollen, making the swelling less painful. The outsole needs to be thick, so it can absorb a lot of force, but it also needs to be flexible to allow your feet to move properly. It’s a difficult balance to strike. It should also be as large as possible – the larger it is, the better it is at distributing shock. Pay particular attention to the heel – if it’s too elevated and too small, it will put a lot of pressure on the most painful part of your foot. If you’re trying to reduce the pain you feel from plantar fasciitis; you’re going to want as much room as possible to move your foot. Having a shoe with a roomy toe box is a must since it will allow you to move your foot in a way that doesn’t strain your plantar fascia too much, thus reducing the stress placed on it. This is probably the most neglected part of a shoe when it comes to shoe shopping, but it’s just as important as the other parts. You also want to get shallow shoes, ankle-high at most. This will make them more flexible and allow your foot to move naturally instead of constricting it too much and placing additional strain on your plantar fascia, which you don’t want. 6What do You Need the Shoes For? Your feet are under different types of stress during different activities – which is why you need different types of shoes for these activities. Still, I get a lot of people who use just one pair of shoes for everything they do – sports, work, going out with friends and so on. This just won’t do. To ensure that your feet are getting the best possible treatment, you need a different pair of shoes for each of those activities. Of course, if you can’t afford that you should at least get the pair that you need the most. For running, I recommend getting a pair of highly flexible shoes that are as light as possible while having a thick sole that is great at shock absorption. 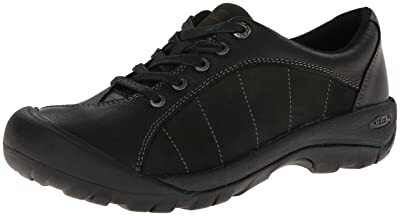 If you need the shoes for work where you walk or stand a lot, comfort should be your primary concern, along with proper arch support. The shoes should also be as sturdy as possible. On the other hand, a casual pair of shoes should just have a good balance of all those properties, while still looking nice. Just avoid high heels and stuffy toe boxes, and you should be fine. Taking out shoe inserts and throwing them away is a commonplace practice – but it shouldn’t be. Shoe inserts are vital to the overall feeling of a shoe and the support it provides. If you have plantar fasciitis, you should be looking for the best shoe inserts you can find. They should conform to the shape of your arch, support it and be thick enough to provide as much cushioning as possible. They should also have a heel cup in order to reduce the strain on your plantar fascia. I recommend that you get a shoe insert separately if your shoes don’t come with good ones. If the shoe is good in all regards except the insert, get it and buy a good insert. However, don’t put a good insert into a bad shoe thinking it will fix it – it won’t. The materials that a shoe is made out of are important when it comes to dealing with plantar fasciitis. Not just the materials the sole is made out of – every part is equally important, and if they aren’t optimal, the shoe won’t help you as much as it should. First up is the type of material used for the upper. It should be fairly flexible to allow your feet to move well and it needs to be breathable so your feet can stay in good shape through the day. Cloth, fabric or synthetic are all fine, though synthetic sometimes isn’t breathable enough. Leather is mostly too rigid and stuffy for a shoe like this. The inside of the shoe should also be made with a breathable fabric and plenty of cushioning. The insole should be thick and supportive, and foam is usually a good material for this – silicone is even better. Rubber insoles are usually not a good choice. On the other hand, rubber soles are quite a good choice – they’re flexible and good at shock absorption. Certain types of rubber, like EVA rubber, are probably the best choice. You want to avoid things like metal studs or various accessories on the shoes since you want them to be as light as possible. Wearing shoes that are too heavy will just put unnecessary strain on your feet. As you can see, good shoes for plantar fasciitis can be difficult to find, and if you don’t plan on buying multiple pairs at once, you better make them last for a while. I know people who replace their shoes every few months, but a good pair of shoes can and should last for at least a year, if not a bit longer – though I advise that you replace your plantar fasciitis shoes after one year. But, shoes can wear out fast, especially if you use them for a lot of running on rough terrain. Still, there are a few things that you can and should do to make sure your shoes last more than a few months and retain their beneficial properties. This seems like a no-brainer, but it’s so easy to forget. Get the shoes off as soon as you get home and don’t wear them when you don’t need to, like around the house. Having different pairs for different activities also helps, but I know that not everyone can afford that. Another thing that’s easy to forget. Just slipping in and out of laced-up shoes can damage them and reduce their lifespan. Laces are there for a reason and make sure to unlace the shoes before you take them off or put them on. Properly lacing them up also has the added effect of ensuring that the shoes fit you better, thus supporting you more adequately and helping you deal with your plantar fasciitis. The heat from a dryer or a washer can shrink or damage the materials, thus reducing the longevity of your shoes. Air dry them whenever you can to avoid that. Also, wash them regularly, especially if they’re your running shoes or work shoes. I’ve had someone come up to me a few months ago, telling me that their prescription shoes for plantar fasciitis weren’t working – they still felt pain. So, I asked them what else were they doing about the pain and they acted surprised and asked me ‘I have the shoes, why would I need to do anything else?’ like I was asking something strange. Therapeutic shoes aren’t a silver bullet and the end-all-be-all solution to a condition like plantar fasciitis. They’re important, but you should be doing other things as well. These few pointers should do you a world of good, but you should also consult a medical professional to get the type of therapy that’s best suited to you. Regular foot stretches are one of the best ways to deal with plantar fasciitis on a daily basis. They help improve blood circulation, thus reducing the swelling but they do more than that. Making foot stretches a part of your daily routine will help strengthen your muscles while making your Achilles tendon more flexible, thus allowing your plantar fascia to stretch further without straining. Stretching your calves will also help reduce the strain on your plantar fascia since they will be more supportive and flexible. This will also improve your walking posture. You can do some simple exercises like rolling a tennis ball under your feet while sitting up straight, doing wall push-ups with your feet around 20 inches away from the wall or sitting and pulling on a belt wrapped around your foot. While massages can be beneficial for dealing with plantar fasciitis, you need to be extremely careful, or you might make the condition worse. Massaging your own foot, using a massage machine or being massaged by someone who’s not properly trained is a huge risk, so avoid it. Try and get help from a trained masseuse. Explain the problems you’re having in detail, and they should know what to do. However, if the massage isn’t helping or you feel that it’s making the situation worse, stop it as soon as possible. If you’re need of immediate relief, this is one of the best ways to get it. Applying an ice pack, or a pack of frozen fruit if you have nothing else, to the bottom of the foot can help with the pain and reduce the swelling. Another beneficial technique is rolling a water bottle filled with frozen water over the bottom of your foot. Therapeutic tape has been known to help with inflammations, and plantar fasciitis is no exception. With that said, just slapping the tape onto your foot won’t do you much good. You should look into help from a professional who can use proper taping techniques which can be more helpful than just applying the tape yourself. Pain relief medicine based on ibuprofen or naproxen sodium can help alleviate your pain while reducing the inflammation at the same time. However, they won’t cure the condition – only lessen the symptoms. Anti-inflammatory creams that don’t contain steroids should also do a decent job of helping you deal with the symptoms. In case all else fails and the problem persists, you might need to undergo corrective surgery. This is not so common, but sometimes it’s the best solution. Consult with your doctor if you feel that nothing else is helping alleviate your plantar fasciitis and they might refer you to a surgeon if they feel it’s necessary. However, surgery is usually only considered after at least 12 months of non-surgical treatment. When most conventional therapy fails to show results, your doctor might give you a prescription for one of a few different treatments which involve injections of different substances. Cortisone injections are the most common – it’s a type of steroid. The aim of the treatment is to reduce the inflammation and pain. However, it’s a risky treatment since it can lead to the degeneration of tissue in the foot and weakening of the plantar fascia, putting you at more long term risk. There are a few other options, like stem cell injections and platelet-rich plasma injections, but they aren’t proven to be as effective as steroid injections. On the other hand, they don’t have next to no harmful side effects, so they might be a good option to try. If you’re highly active and you encounter a bout of plantar fasciitis, a period of rest of about a week or two should help curb it. Of course, you should combine this period of rest with other treatments for the best result, including stretching. After this period of rest, start out slow when returning to your regular physical activities – don’t just jump into them like you never left. That could cause the plantar fasciitis to return worse than ever. Ease into your previous routine over a period of a few weeks. 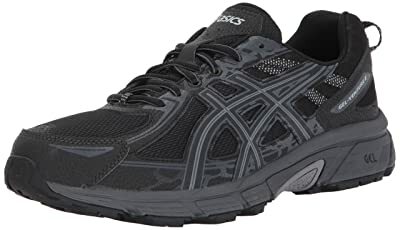 Is buying a good insert for my current shoes enough to deal with plantar fasciitis? While a good shoe insert helps and can improve your current shoes, it’s not nearly as good as having a shoe designed to help with plantar fasciitis combined with an insert designed to do the same thing. If you want to deal with this condition the right way, you’ll probably want both. Half-measures simply won’t do. Are plantar fasciitis shoes good to wear for prevention? Yes, they are. If you suspect that the shoes you currently wear might lead to you developing the condition or someone in your immediate family already has it, shoes like this will help prevent it from developing while making your feet feel more comfortable. Can I run in plantar fasciitis shoes that aren’t intended for running? Should I wear these shoes if I have a low arch? Yes, if they fit you. Both people with low and high arches are prone to plantar fasciitis, but they need slightly different shoes to deal with it. Shoe inserts are important too, so make sure you get ones that properly support your arch type. Are these shoes useful for dealing with conditions similar to plantar fasciitis? For the most part, yes. If you have symptoms similar to plantar fasciitis, they will help ease them, but they won’t necessarily help reverse the progress of the condition or cure it. In some cases, they might also make the condition worse, so you should definitely consult with your doctor before buying these shoes to treat a different condition. Can these shoes cause other foot issues? In certain cases, they can. 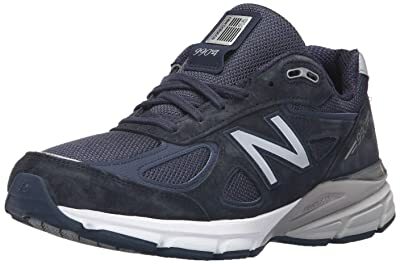 If you don’t have plantar fasciitis and have a foot type that’s not prone to it and not well-suited to shoes like these, you might feel pain or discomfort when wearing them. 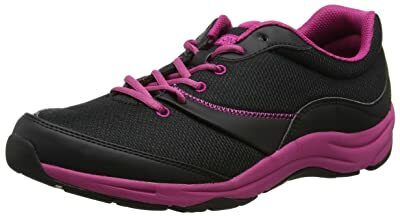 My best advice to you is – if you don’t have plantar fasciitis and are not at risk of getting it, you probably shouldn’t wear shoes like these. Is it necessary to get shoes like these if I have plantar fasciitis? If you want to get better, it almost certainly is. You probably spend most of the day wearing your shoes, and that affects your feet greatly. Other things like medication, massages and other types of therapy can help with plantar fasciitis, but wearing the right shoes is a must if you want to get better. Do the shoes need to be therapeutically certified to help with plantar fasciitis? No, not necessarily. The shape of the shoes is probably the most important part – they need to fit your feet well and work to reduce the symptoms of plantar fasciitis in order to help you. Therapeutically certified shoes give you a certain guarantee that they will help, but they can also be quite expensive and ugly if I’m to be frank. Therapeutic certification is not necessary except if you want to have peace of mind. My shoes for plantar fasciitis are making it more painful – what should I do? Stop wearing them immediately and visit your doctor to find out what’s wrong. Don’t keep wearing them in hopes to ‘break them in’ or think that pain means that they’re working – it means that something’s wrong. The reasons can be numerous – the shoe might not fit you well, it might be falsely advertised as a shoe that helps with plantar fasciitis, you might have some other foot condition and so on. Go to a medical professional and get more information. How long does it take to see the beneficial effects of shoes for plantar fasciitis? You should be able to notice some effects almost immediately, especially if you’ve been wearing shoes that made your plantar fasciitis worse. Your feet should hurt less when you’re walking or running in your new shoes, and it should be easier to move them. The long-term beneficial effects might take a while to show, sometimes weeks, sometimes months, but you should see at least some improvement right away. So, that’s about it for today! There’s only one thing left – I need to give you my pick of the best shoes for plantar fasciitis. I can’t say that I’ve struggled too much to pick the winner since the Orthofeet Men’s Highline High Top Boots fit me the best. The insoles they come with are just amazing and they can be used for many different situations. What did you think? Do you agree? Pop into the comments and tell me all about that.